Description:- Arava 20 mg tablet is used in the treatment of rheumatoid arthritis.It blocks the action of certain chemical messengers that are responsible for inflammation, swelling and redness associated with certain joint diseases. Do not drive or operate machinery because you may feel sleepy or dizzy while being treated with leflunomide. Do not start leflunomide, if you have a kidney, liver, blood or lung problem; have low level of proteins in blood (hypoproteinemia), low level of any blood cells, or suffering from any disease with lowered immunity like tuberculosis or AIDS. Do not start leflunomide, if you have intolerance to some sugars because this medicine contains lactose (a type of sugar). Do not take leflunomide, if you are going to receive any live vaccine; or if you experience a widespread rash with blisters and peeling skin (Stevens-Johnson syndrome), widespread peeling of the superficial layers of the skin (toxic epidermal necrolysis),or drug reaction with eosinophilia and systematic symptoms (DRESS). 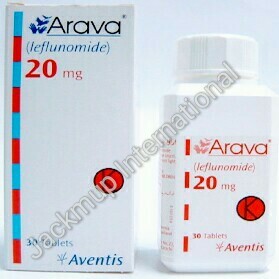 Avoid using leflunomide, if you are pregnant or planning to become pregnant, breastfeeding. Side Effects:- Nausea, Headache, Dyspepsia, Rash, Diarrhoea, Increased liver enzymes, Respiratory tract infection.